I remember the day I hit 29 followers and I was so excited. 100! *Flail* Thank you so much for reading. Honestly, if it wasn't for any of you, I wouldn't bother to post. Knowing that at least one person out there is paying attention makes it oh so worth it. Ok, on to the giveaway. I know that's why y'all are here. Lol. I will probably never do a giveaway this big ever again. It just kinda happened that when I was thinking of doing a giveaway, I saw an almost empty display of Sally Hansen's Project Runway collection. That more or less made up my mind. Since then, I've just been grabbing whatever I thought you guys would like. I was originally going to do this giveaway as a celebration of 50 followers, but I wanted to get all the polishes swatched first. This goal was achievable at the time, but I didn't get any sunlight for a while and when I originally made this goal, I was only at 5 polishes, all of which I own. But yeah, that 50 follower mark came and went and I kept adding polishes and... well, you can see for yourself. I don't own all of the polishes here so I can't show you swatches of all of them and I'm not going to give away used polish. But I have linked the polishes that I've swatched. ...LMAO, I still haven't gotten to the giveaway. This picture's been updated. I realized I'd forgotten a polish in the other pic. So it's 17 polishes instead of the 16 from the first pic. Polishes are not listed in the order they are displayed. Purple Heart, Mystery Night, Black Passion, Gasoline, Golden Dragon, Hot'n Sweet, Peachy, Lambada, Metallic Green. Valentino, Project Runway, Fashion Forward, Purple Heart. Crushed Velvet, Mulberry Wine, Passion Plum. 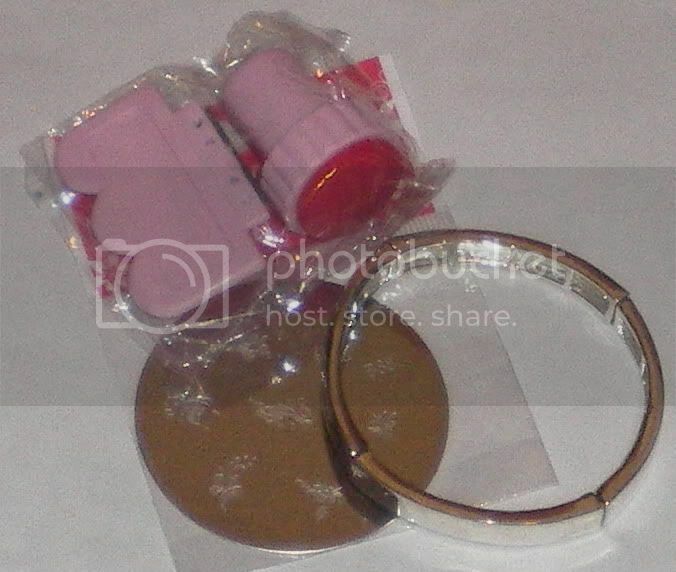 StBF has also included a little bracelet, stamping plate, scraper and stamper for you guys. Omg, gross, I can see my lips reflected in the plate. So unnatractive! Hahaha, I swear, they don't look like that normally. I look angry. -This giveaway is for followers only, so you must be following me in some form. You must leave me a comment here with your email and tell me how you're following me (Ex. Through blogger, Google reader, Twitter [I just totes got myself an account, check it out to the right. ], email subscription, or through the LJ syndication feed.) for one entry. -Post about this giveaway in your blog and include the link in your comment for another entry. Please tell me in your entry that you have blogged or tweeted, as the case below. Don't just leave a link and assume that I'm going to include your entry. -Tweet about this @PerryPiePolish and include that in your comment for another entry. Maximum three entries per person. This is open to everyone. (Just not to the moon, sorry. Shipping up there is obscene.) Contest open until February 28th 11:59pm MST. Yay, congrats! I'm a follower through blogger. I added your giveaway to the righthand side of my blog, right at the top. I follow blogger/ yahoo reader. Congrats, lady. I follow you on here, blogger. I'm the girl laid on the grass with my hand on my face. I'm a follower through Blogger :D Congrats on 100! Hey, I'm following you via the lj syndication and I posted about you in my lj....and this box won't let me paste, but my livejournal is syncopatedlife. Awwwesome giveaway and congrats on 100!! Congrats!! I follow through google reader and/or Opera feeds. I do follow! No blog and I don't tweet. I think I am too old for it. I follow through Blogger and Google Reader. I don't tweet and/or blog, but I definitely follow you via blogger/google reader! I follow you through google. I'm dying to try some of the prizes! How exciting 100 followers! Congrats! Hi hi! I follow you through Blogger! I also put you in my blog! Hello, I'm a follower through Google. I follow through Google! This giveaway is about 400x better than a pile of unicorns, btw. I'm a follower, i tweeted and blogged this! I'm following you through blogger. 1) I'm following via RSS Feeds! New Follower thanks to Thess posting about you. I tweeted and I've added your contest to my blog also on the right hand side with a link to you here. OMG~the best blog giveaway I've ever seen!! I'm following you through Twitter & my email address is jewel_the_jewel at hotmail dot com. I follow through twitter and I just tweeted about it! WOW!! What a HUGE, HUGE (and so totally awesome!) giveaway!! I'm excited! I'm a new follower and happy I discovered your blog :) My email is BlogBabblingBrooke@gmail.com. And I'm going to go Tweet about it! @BBabblingBrooke (2 B's in a row). Thanks so much for the great giveaway - and congrats on reaching (over) 100 followers!!! congrats! you rock! i follow you on here and in google reader! What a awesome giveaway! Love all the polishes!! I'm your follower on google reader! Hmm I'm not really sure how to do this! But I follow you on Lj and twitter and have retweeted the contest tweet! I'm a follower and I'm sure I follow you on Twitter already. Thankyou for the lovely contest. 1. I'm a follower through Blogger! Here's my first entry, I'm your follower via google friend connector. Yay ty for this! Congrats on 100+ followers ;) I'm sure you'll get a ton more through twitter RTs! I'm a follower (as Team Morris) through Blogger. I also Tweeted about this giveaway (http://twitter.com/katygmorris) and now follow you on Twitter! It's a very big et wonderful giweaway !!!!! Amazing. Thanks very much for it. I also tweeted about this (username nachtfee). And congradulations on (over) 100 followers! I'm a new follower to your blog and i just love your blog name...too cute! Enter me please ! I'm a follower through Blogger! Congrats on the followers and thanks for the wonderful giveaway! i follow you on livejournal. my email address is funeralhair@gmail.com! thanks! Congratulations! Hi, I'm a follower on google. Great giveaway, thank you! Anyway, I'm following you via Blogspot, (blogger or whatever it's called) now and look forward to your posts. hey i'm following you through Google reader! Congratulations! I'm a follower via Google reader. Thank you for the amazing giveaway! I am a follower through blogger, contestsandsuch@gmail.com. Hello I follow using Google Reader. I don't have a blog or tweet tho. Oh wow! Amazing colors in an amazing giveaway O.o I follow through blogger. I'm a follower. Thank you for the great giveaway! Congrats on the 150 followers! Congrats on all the Followers and thanks for the awesome contest! I'm a new follower (with Google Friend connect)! WOW! great! I'm a follower through blogger. I added your giveaway to the lefthand side of my blog, right at the top. thanks! I hope to win!!!!!!!!!!!!!!!!!! Congrats on 50 followers! :) Thank you for hosting this awesome giveaway. I follow your blog through Google Blooger Dashboard. I follow through blogger and read through google reader, if that makes sense? I follow you via Google Friend Connect and on twitter. I get your blog updates in Google Reader. My email is rickiebeth at gmail dot com. It's closer to 200 followers on Google. Right now it's 162. I'm subscribing through the syndicated LJ-feed and just added myself as a Google follower. More blogs should be LJ-syndicated though, it makes things so easy. Anyway, Gosh is a brand I've been interested in trying out, so I am most definitely entering in this giveway. I'm a follower! Through blogger/google reader! You are up to 163 as I write this! Congratulations! Hi, I follow you through bloglines. Great contest, I'm drooling over the project runways! Congratulations on 100+ followers, your posts are awesome! I follow you on my Google Reader. I'm a follower from google, love your writing style :) What a fun giveaway! I'm a follower! This is an awesome giveaway! Wow, what a great giveaway. And congrats on almost 200 followers! I'm following you via blogger/google reader. And I am following you on Twitter, and I tweeted! I just post a tweet obout your giveaway! I'm a follower! Love your blog! Congrats! Follower here (google friend connect) & Twitter (@fashionedfinn). okay i deleted my first comment because i forgot to put in my email! OMG what a fantastic giveaway!!!!! even if i do not win can i ask you a favour?? 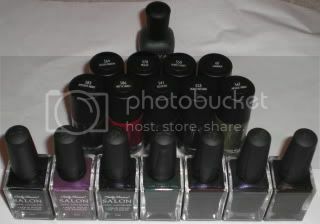 if you come across the canadian sally hansen NP exclusives again will you buy them? i will pay you for the cost and ofc s+h charges...i'm DESPERATE for them and i don't live in canada!!! i'm going to email you asking this as well! email me at sara(DOT)hollander(@)gmail(DOT)com ! I just wanted to ask, if I sell you my soul, do I get any more entries? Enter me please! :) I follow you via Google. I'm a follower via google and twitter! I'm a follower through the google friend connect thinggie on your right hand side column ^^ My email is moncoinamoua(at)hotmail(dot)com. PS Sorry about deleting my previous comment, there was a mistake in my email address. I'm a new follower through blogger. just started following your blog through google reader. love it already! Hi! I follow you on Google Friend Connect, and have just tweeted about your giveaway! http://twitter.com/skgoh/status/9130390583 Please include me in the draw. sheri[dot]goh[at]gmail[dot]com. Thanks and congrats! BTW, congratulations, you reached 204!! I follow your blog on Google ! I suscribed through Google Reader and tweeted about the giveaway! congrats! I'm a follower through blogger. I'm following you through Google Friend Connect! What a great giveaway. I'm following via Google Friend Connect. congrats on the massive follower explosion! Hi, I followed you on google. I also posted about this contest here, and have you on my blog roll. I hope I make it! Hello. I'm a follower (Rita following on google). and i'm really excited for this giveaway !!! Just to say that i have entered your wonderful giveaway....!!! My blog is missverniz.blogspot.com (that you are very welcome to visit) and my mail is blogmissverniz@gmail.com, and i'm from Portugal....!!! I'm already a follower of your blog, and i have put you in my blog roll....!!! Hi, new follower with Google friends! Awesome giveaway. Enter me please! Great contest, thanks! Hi! Just found your blog and I'm now following you via Google Reader. I follow you through Google Reader. :) Great giveaway! Thanks for the opportunity! WHAT A GREAT GIVEAWAY AND BEAUTYFUL POLISHES! AI AM FROM ISRAEL, SIGNED AS A FOLLOWER JUST NOW BUT I AM ENTERING THE BLOG ALMOST DAILY FOR A WHILE NOW. Great giveaway! & definitely congrats!! I'm having a giveaway as well! Love your blog! I follow through a reader. I follow you on blogger and google. Hi! I'm following (via Google)! HEY! i'm a follower through blogger! I am a follower through the google blogger. So much purple :) Wow! I am a follower trough google blogger. Hi! The giveaway is amazing! Fingers crossed!! I am following via google, email is wizardsofbling@gmail.com. hi! im following you on Google Friend Connect via blogger. :) thanks for having this! I'm a follower through Google, Twitter, and RSS to my Mac Mail program. Ok, I'll admit, I only clicked on your blog because of the link on somebody else's blog talking about your giveaway. But once I saw the "GO CANADA GO!" banner on your site, IT'S SUBSCRIBING TIME. 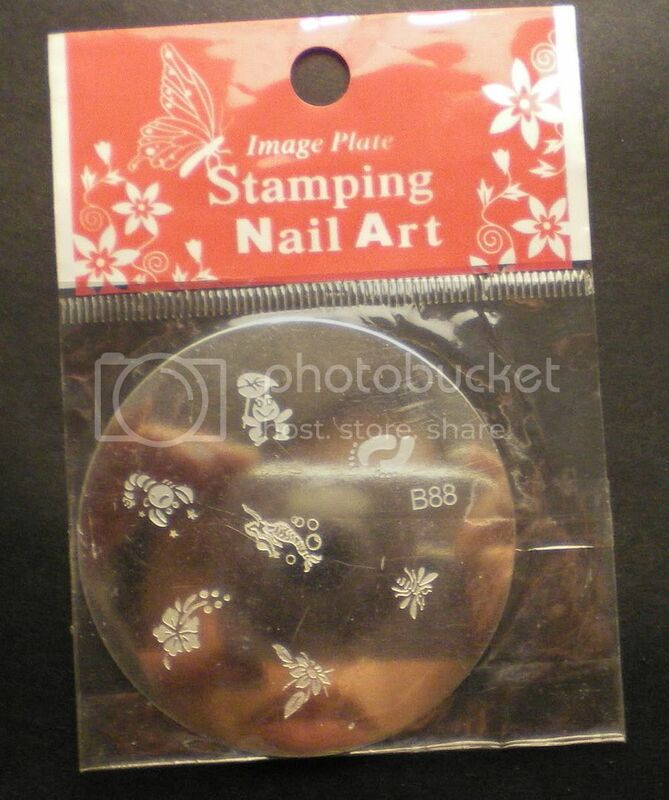 I don't know why but it seems to be kind of hard to find Canadian nail bloggers these days? Anyway I'm a subscriber through the Google... Thingy. My email is chichi.cherry33 at gmail dot com. Hi, I'm a follower though Google Something, I never remember how to call it. i dont know if it minds i'm from the netherlands? woo hoo 100! i remember my 100 and it is such a good feeling to know that there is someone out there (100 of them to be exact) who cares about what you have to say! congratulations!! !